Rock and Water is an evidence-based, scientifically proven programme used to develop social skills, self-control, self-confidence, emotional awareness, resilience, self-respect and self-realisation for students and adults, using a holistic approach. It is used in at least 30 countries and has been delivered to an estimated 2 million young people. Physical in nature, the programme uses games and exercises to develop strong physical and emotional awareness (mindfulness and much more! ), mental strength (including practical and effective strategies for developing and maintaining positive mental health, reduction of anxiety) and social competency (communication skills, assertiveness, dealing with bullying/violence, acceptance of others etc). 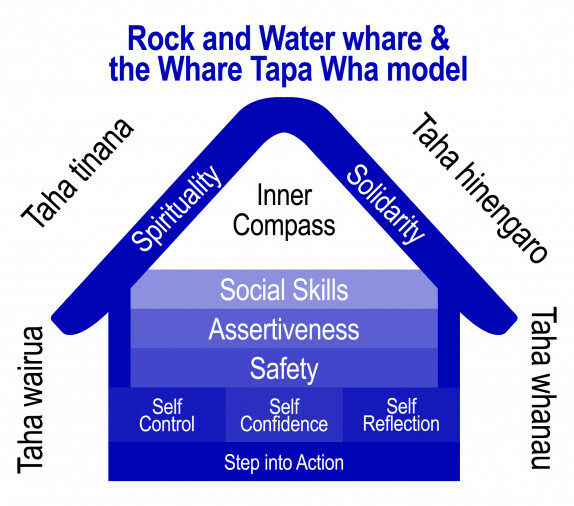 This workshop covers the whole programme (17 chapters) as well as including enlightening theory sessions about Rock and Water in the NZ Curriculum, boys and girls education, learning styles, personal development, getting started and the theory behind the programme. A comprehensive manual is also supplied for trainees. Participants on the three-day training regularly experience fantastic personal development for themselves, as well as developing effective teaching skills and learning about an exciting programme. This is the ideal workshop for those wanting to deliver Rock and Water programmes to participants nine years and older.